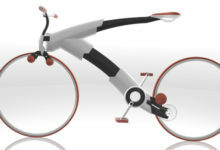 A bicycle isn’t the first thing that comes to mind when think of a minimalist piece of art. Well think again! Ion Lucin & Colorsponge created Baik, a bicycle designed with little elements as possible.